Soaring Over Roads - Mustangs, Etc. From 1960 to 1970 the Ford Falcon was an animal to be reckoned with. Competition in the compact car market has always been fierce. At the end of the 50's, more European imports were seen in the US. People became interested in smaller cars but were still adamant about buying American. At the same time, large automobiles were becoming more expensive to produce. American families were beginning to purchase second cars and market research was beginning to be used to see what preferences were like. It seemed that compact cars were in but room and storage was still a priority. Ford General Manager Robert McNamara was in charge of putting together a team that could build something smaller but still within American tastes. The design was a unibody with standard suspension using coil springs in front while a focus was placed on keeping costs as well as weight down. With limitations in mind, engineer in charge Harley Copp took to using parts already produced by Ford to build something distinct. The first Falcon engine was a 95 hp, 2.4 L Mileage Maker straight-6 with a single-barrel carburetor. The transmission options were manual 3-speed with column shifter or Ford-O-Matic. In 1961 two new Falcons were introduced. One was the bucket seat, higher trim Futura sedan and the other was a sedan delivery. Advertising brochures began to feature characters from Charles Schulz's Peanuts comic strip as Ford pushed their cars into more advertising formats. A slew of models with all levels of trim became available over time. Ford and the public loved the car. Competitors began to notice and started developing their own compacts to compete. The Falcon took on a more angular and modern look in 1964. A large variety of body styles were available off the bat. Around this time the Ford Mustang was developed and released. The Mustang took many cues from the Falcon but was marketed to be the car of the young and sporty, beginning taking a significant number of sales away from the Falcon. Another redesign came in 1966. This iteration was based on a shortened Fairlane platform, taking on a longer hood, short deck, and becoming more Mustang-like. One more change came in 1970. 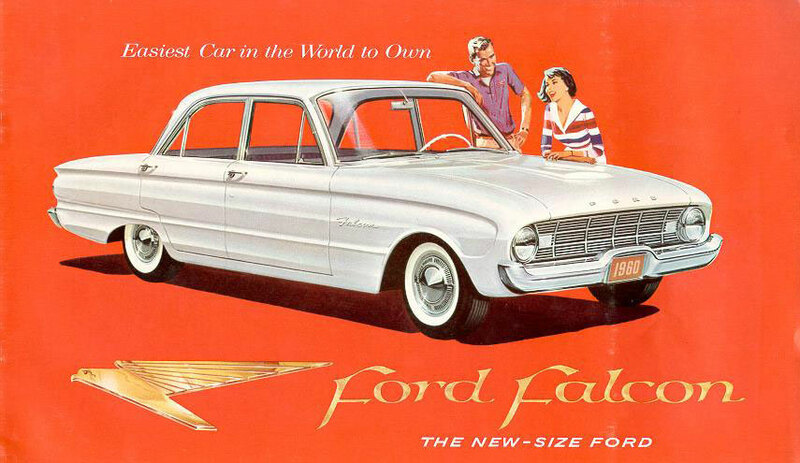 This was the last model of the Ford Falcon released in North America. Sales had declined too significantly between competitor cars and the overwhelming popularity of the Mustang. The Falcon name was transferred to a low price version of the Ford Fairlane and marketed as the Falcon '70 1/2. This version was available as a 2 door sedan, 4 door sedan, 4 door wagon, and all used the Fairlane/Torino power trains. Although the demise of the Falcon came in America, Australian engineers were given the chance to keep the line alive. The Falcon name continued to modern car styles and had its last Australian model in 2014. In the end though, not much can beat the classic American style of the Ford Falcon.